Factories hold a certain fascination for me. I still remember how, as a child, we went to visit the pink buildings of the Chelsea Sugar Refinery (unfortunately, public tours are no longer offered). I was intrigued to learn that they didn't have a problem with ants, because the insects killed themselves from eating too many of the sugar scraps, before reaching the main production area. I was also surprised to see the machinery packing sugar into bags labelled with the supermarket brand Pam's. Oh, and we got a free sugar sample, of course. 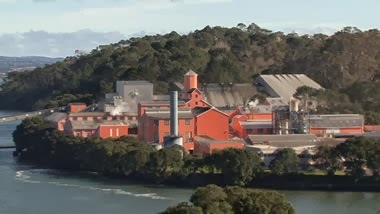 Chelsea Sugar Refinery at Birkenhead. Recently, I discovered a TV series called How It's Made, which shows you what goes on in the making of everyday things, from contact lenses to toothbrushes to straw sombreros. The first season of the show aired in 2001, and it is so popular that it is now in Season 22, and is translated into numerous languages. Of course, among the episodes are many food-related ones, which I have linked to below, along with some similar videos I found on YouTube. Some of the topics sound obvious, like frozen fruit. Uh, I thought, don't you just stick the fruit in a freezer, then seal it in a bag? Once you watch the episode, however, you realise there is slightly more to the story, like washing the fruit in chlorinated water, sorting it by size, removing any pips, and slicing the pieces. Likewise, the making of orange juice may seem trivial, until you consider how to pick a very large volume of fruit quickly. As the programme is produced in Canada, it is American-centric. For instance, one episode shows the washing of eggs, which is something done in North America, but not in New Zealand or the EU (see Why American Eggs Would be Illegal in a British Supermarket, and Vice Versa). And we have grass-fed cows, of course. Whether the details apply to us or not, they are addictive for the curious, as long as you can overlook the terrible puns in the narrative. I assume the producers are happy for us view the episodes on YouTube, since there's a channel that calls itself The Official How Its Made Channel, and they have also made some videos available on the Discovery Channel website (though I had difficulty viewing these). If you want to know exactly where filming was done, there is a list of factories which opened their doors to the camera crew.